Baegert was the head of a family of painters who worked in the Rhineland area in Germany during the last third of the 15th century and the first third of the 16th. Baegert organised a productive workshop in Wesel with his son Jan and Jan Joest, who was possibly his nephew. He also worked in Dortmund, Cologne and Kalkar. His date of birth and place of training are unknown, although stylistic similarities between his work and that of the Utrecht school suggests that he trained there. In 1476 he is recorded in Wesel, a city where his son worked as an independent master in 1490. Father and son travelled together to the Low Countries in 1482, a fact that is crucial for the evolution of their art, particularly that of Jan. Although he borrowed elements from Netherlandish art, Derick’s style always remained close to that of the late Gothic. His spatial organisation is a characteristic feature of his work and is somewhat awkward with regard to the recession into depth. He tended to locate his figures in a narrow zone that acts as an intermediary point between the foreground and background, adding distant landscapes with views of cities in the latter. Baegert’s first known work, dated between 1468 and 1476, is the high altar of the Dominican church in Dortmund (now in the Propsteikirche), commissioned by Johann I von Kleve. This is a very large triptych of around 2 x 8 metres with the city of Dortmund depicted in the background of the lateral wings. Among his documented works is an altarpiece of 1477, painted for the church of Saint Nicholas of Mathena (Wesel), some of the panels for which are now in the Museo Thyssen-Bornemisza. 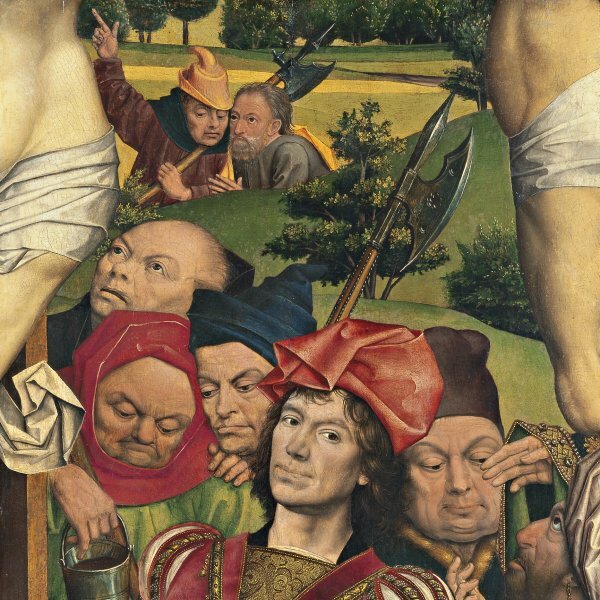 Between 1493 and 1494 Baegert painted a judgement scene for the Town Hall of Wesel, now in the Städtisches Museum in that city. Among the works from his last period is Saint Luke painting the Virgin (Münster, Westfälisches Landesmuseum), executed in his mature style. The last known reference to the artist dates from 1515.